Apple has presented some new features in iOS 11 that are already familiar to us Android users. On the other hand, Android O is continuously expanding its strengths, which iOS users are having to do without. We decided to compare the two systems. Which devices get iOS 11, which get Android 8.0 Oreo? iOS is only available on original Apple devices and is centrally controlled by Apple. The oldest devices with the update date back to 2013. In the case of Android 8.0 Oreo, however, it is up to the individual smartphone and chipset manufacturers and network operators to adapt the available source code to their respective devices, test it and release the update. This does not happen immediately, often there is delay of several months , except in the case of Google Pixel which has the advantage of immediate updates. The usual maximum age of an Android smartphone that still receives a major system update is 18 months. In addition to system updates, Google also provides monthly security updates, the source code of which is also available for devices with old Android versions such as Android 4.4 KitKat. Unfortunately, smartphone manufacturers only implement these updates in exceptional cases for old hardware, so Google's effort is lost and Android devices are generally less secure than iPhones. Attack vectors at the system core level such as BlueBorne thus remain open. After all, security vulnerabilities at the user level can be updated by updating the Play services and the WebView service from the Play Store. These are also available on devices older than four years. What are the biggest differences between Android (8 Oreo) and iOS (11)? Apple generates a high degree of customer loyalty, above all through the ecosystem of its products. The fact that iPhone users often have an iPad or a MacBook is due to the simple networking of the products. The iCloud serves as an online storage where settings, passwords and photos as well as licenses for purchased videos are stored centrally for use with all Apple devices. If the user switches from one iPhone to the next, he or she can apply the settings of the previous device to the new device. Manual app downloads or new registrations are no longer necessary; even contacts and the list of past calls are displayed correctly on the new iPhone. Android’s setup assistant can do that as well or at least, it can do on the devices of many manufacturers. At the initial start, the assistant pairs the old and new Android device via NFC, cable or another interface, thereby transferring accounts, images, text messages and other information to the new cell phone. Google was able to achieve a similar online backup service with its counterpart Google Drive and the automatic backups since Android 6.0 Marshmallow. The automatic deletion of the data after two and a half months and the chance for error in the backups, if you change or reset the devices frequently, make the feature incomplete and useless in many cases; especially since app developers can block the backup function. With the iPhone, apps can be downloaded and installed almost exclusively from the App Store. Exceptions are reserved for developers with official tools or hobbyists who jailbreak their devices. However, the Walled Garden principle is a feature welcomed by many Apple customers and ensures that the ecosystem is largely free of malware. Google has changed the security concept for apps from unknown sources in Android 8. This enables the trusted third-party store F-Droid and prohibit other apps from installing APKs. Whether browser, launcher, keyboard, language assistant, calendar, camera or map service: Google and Android give you free rein to decide which app and which provider you want to use for important tasks. The user experience becomes completely individual and adapts to your taste and habits. Apple's iOS, on the other hand, delivers a unified user experience and an all-round concept whose components are optimally matched to each other. This becomes ever clearer with the AI behind Siri, which analyzes e-mails, enters appointments in the calendar, navigates you to your destination on time and automatically adds concert tickets or boarding cards to the Wallet. If you connect your Android phone to a computer, you can copy any files to it and open them on your Android phone - provided the file type can be opened. So if you bought your music from a DRM-free online shop or converted your CDs yourself, you can simply copy these files to your Android smartphone and play them back without the hassle of iTunes. In the same way you can browse USB sticks, external hard drives, microSD cards (also via USB reader) or even other smartphones. The USB port is versatile thanks to inexpensive adapters. For Apple, there's the new app called Files. However, it is not a local file explorer or Apple's answer to "downloads" in Android. Files indexes the files that you have placed on different cloud services, including Google Drive. The internal memory remains accessible only to individual apps and is not used as open to users as in Android. It was actually so obvious that you really wonder why they hadn’t thought of it before: Apple is integrating the QR reader into the camera app. If you hold the camera app over a 2D code, a heads-up notification appears with the URL or readable transcription. On Android, this function is only available in a few manufacturers' camera apps. People often download QR scanners from the Play Store, some of which contain ads while others read and sell your data. 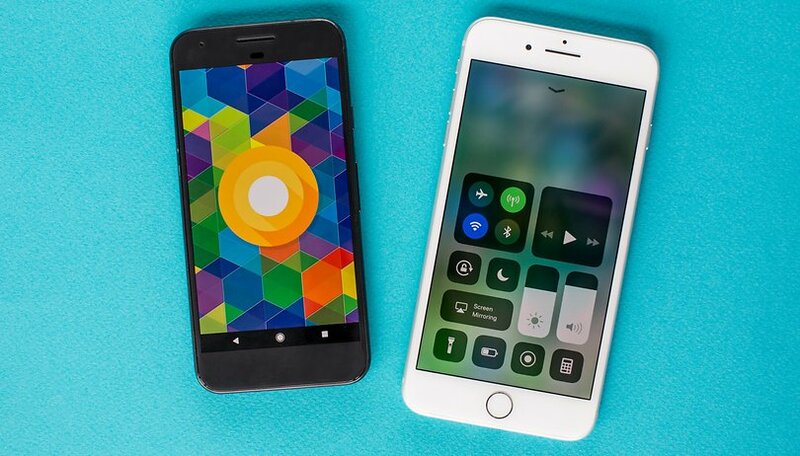 What features do iOS 11 and Android Oreo have in common? Both Android 8 and iOS 11 can automatically fill out passwords and forms in apps. These features are reserved for the browsers Chrome or Safari. Your data already stored in the respective cloud will no longer only be typed on websites but also in apps. However, the implementation is slightly different. Apple integrates the Password Manager into your device settings. If you have already entered the login data for a provider there, you will see corresponding suggestions for the log-in on the keyboard. Your app and website log-ins are protected against unauthorized access by Touch ID. That's a good thing, after all you can openly view the passwords there. Google, on the other hand, implements the system as an open programming interface in the form of the Autofill API. This allows third-party providers such as LastPass to jump on the bandwagon and replace Google as a repository for all your passwords. If you leave it on Google, you manage the stored passwords here. iOS 11 now arranges notifications by how recent they are. In the first test, it looked like anything older than three hours was categorized under “older notifications”. It does not appear at the top on the lock screen but instead, it needs to be swiped up from below. On Android, the new notification system was already introduced with the update to Nougat 7.0 . It sorts notifications according to the apps that send them. They also provide quick actions for replying immediately before opening the app. Holding down on the notification takes you to the notification settings for the respective app. At least it lets me configure the interruptions substantially faster than on iOS 11. Siri, Apple’s voice assistant, can finally control apps. If you say: “write a message with Telegram”, Siri will ask whom you wish to send it to. This function is extremely useful in the car, when wearing the headset or when you just want to quickly bark out the command. Apple already managed to get WeChat, Slack, WhatsApp, Ridebooking, Uber, Lyft and Didi on board with the Siri interface. When it’s complete, the feature can be used in all Siri languages right away, which is something that Google’s voice assistant can do, too. We have already prepared a list of Google voice commands for you. Many Android smartphones are retrofitted with the Google Assistant. It enhances the functionality of Google's voice search with, among other things, a deep integration into the smart home. Both Google and Apple are establishing systems that want to compete with Amazon Echo and its voice assistant Alexa. However, this does not prevent Google from running voice assistance as an interface. So you can replace the Google Assistant as a default helper with Cortana or Alexa, as you like. Apple's Home app provides a uniform interface for home automation. Previously, hardware manufacturers for smart home appliances could not or only occasionally agree on standards for control. Mixed operation with devices from different manufacturers could quickly become complicated. However, the HomeKit interface simplifies this mixed operation and thus reduces the inhibition threshold for potential smart home customers. A few weeks after the launch of Apple Home, Google countered this by quickly renaming the Chromecast app to Google Home. This will also integrate smart home devices from different manufacturers and, above all, manage the smart loudspeaker Google Home. The presentation of the app is not quite as successful as Apple Home, however. For some time now, you could order a cab driver in Google Maps via its taxi integration. Apple Maps lets you track the Taxi, Lyft or Uber vehicle live on the map, and you can also pay directly in Apple Maps. Apple Maps is finally able to navigate indoor just like with like Here Maps or Google Maps. It allegedly works in the US, but Google Maps is still the quickest way to find the nearest McDonald's at JFK international airport. This function was already introduced as Force Touch with the iPhone 6s in Fall 2015. Android 7.1’s launcher shortcuts copy this feature. Press and hold an icon to access quick-start options that perform a certain action with the app. For example, Messenger starts the chat with favorites contacts, Maps navigates you home immediately. Android allows you to customize the actions and save them as individual quick-start icons on the homescreen. In Android 8 Oreo, Google has also attached the notifications to the app icons in the form of small bubbles. If an app has such a bubble, you can see the notifications directly in the shortcut menu. Running two apps at the same time is no fun on the small iPhone screen. Android smartphones are often considerably larger. This makes the added value more apparent. iOS 11 masters multitasking on tablets with drag and drop for text. Android also lets you effortlessly drag and drop text from app to app and you can do it on smartphones too. By the way, this has been possible since Android Nougat, provided the respective smartphone manufacturer has implemented the standard feature into its version of Android. The control center is a great idea to provide easy and quick access on the lock screen. iOS 11 lets you choose which ones are displayed. Maybe Apple will allow third-party providers to access the buttons someday. Android has already implemented this. Since Android Nougat, third-party providers have been able to officially place tiles in the quick settings. Furthermore, managing quick settings is way more intuitive than the control center. Filters blue from the display. iOS 9.3 brought nighttime mode to iPhones. Android 7.1 has it under certain conditions. An update was announced that will become a standard feature, and we hope that Google will finally make up its mind. ARKit and ARCore make conventional smartphones fit for AR applications. Although the technology is still young, developers are working to create the next generation of applications. It is not yet clear which of the two platforms is the superior one. This depends in particular on the willingness of the app developers, who will determine the quality of apps on each service. Apple Wallet allows users to store coupons, boarding passes, event tickets, store cards and (starting with iOS 8.1) credit cards, loyalty cards, and debit cards via Apple Pay. For example, after the online check-in for a flight, boarding passes are collected in the card, and Wallet receives the concert ticket from the confirmation e-mail. Rarely do you have to do more than one click for this to happen. The appropriate card will then be available on your lock screen as a notification. Google, on the other hand, offers Google Wallet and Android Pay as a counterpart to this, which stores your credit cards and lets you use your handset to pay for items. Then there are various 3rd party wallet apps that will let you store your tickets and passes just like with Apple wallet. Looking at the development of both systems, it feels like watching a tennis match. Ideas are thrown about like a ball over the net and each player hopes that the other will mess up. This is the only way that Google or Apple can score points with their customers, who use these functions and evaluate devices according to them. The overlaps between the iOS and Android systems are considerable. Together with smart home and augmented reality, both are pointing in the same direction for the future. The future tech ecosystem is networking with our environment and the smartphone itself is increasingly marginalized The next hurdle will be to tailor the smart ecosystems to our needs and convince app developers as well as hardware and accessory manufacturers of their potential. I welcome the fact that Google is preserving the openness of the Android ecosystem. Features such as third-party apps, the free use of the file system, or the definition of standard apps including the voice assistant, however, show that Android is more open than the Walled Garden of iOS. The self-determination of the user and the hardware manufacturers is what drives the masses to this system. iOS, on the other hand, creates an all-in feeling. The apps are seamlessly interlocked, the user experience is consistently smooth and the product range is coordinated. However, this is both a blessing and a curse, as the user has to adapt to this structure. Apps, videos or music can only be procured in a few ways, file management is not provided. However, if the user can become accustomed to this re-education, they will not want to leave this ecosystem, in which the grass is so much greener and constantly tended by Apple. Which iOS feature would you like to see in Android or which Android feature would you like to see in iOS? Is there any new feature that you love and we haven’t covered yet? Let us know your thoughts in the comments below! Very good article that includes some news about recent versions that I didn't know. Apple excels at building into a fairly elegant interface one way to do most everything, but forcing a lot of conformity and a lot of ongoing nickel and dime expenses to do it. Android provides more choices, both in selection of OEM configuration and overlays (which are not covered in the article) and in giving me a lot more leeway to decide what I want to do and how to do it. The only thing that appeals to me about Apple's approach is the ability to obtain system updates and upgrades universally while most Android buyers are victims of monkey OEM and monkey telco pointing stupidly at each other to explain why paying customers will never get Android updates or upgrades. Microsoft solved this twenty-five years ago on Windows PCs at all price points, without sacrificing OEM freedom to innovate (or bloat) the interface or curtail end-user freedom to reconfigure and add or delete. I can't understand why Google doesn't simply commandeer the implementation and updating/upgrading of Android on a certain date and solve this serious systemic failure. That aside, Android is the better way. Buy the ecosystem that works for you. There is no difference in functionality, only interface and devices. I own and use both on a daily basis. One feature that ios does far better than Android is restore app data when setting up a new phone. Unless you are rooted, there is no way to do this on Android, which leads to hours of work restoring data (Helium app helps). When I set up a new iPhone or iPad, all app and user data gets transferred automatically. This is usually vendor-specific. Apple does it since they have basically one flavour of their OS, so it's as if they are selling one skin of Android. Similarly, Huawei offers full device backup, but it works with their devices. Probably Samsung does too, for their devices. It's probably impossible for Google to implement full backup that works across devices, since manufacturers add vastly different features. What you do get on Android is easy restore on the Google side. Your emails, contacts, photos etc. - even apps and icon layout can be restored. I think it's pretty good, and on the other hand, I find the incessant iOS backups and the need to use iTunes (if you don't want to pay for iCloud, which applies to most people) extremely tiresome. I can tell u have never used a Google pixel phone, which also gives u Google photos full quality photos unlimited free storage and Google photos in features is leaps and bounds ahead of iCloud . 2 years in a row with smooth software and no crashes . They beat em in camera, battery , speed not benchmarks , features , cloud storage ..
Google is really coming through and build an ecosystem that works on all devices including apple devices unlike apple is greedy and forces u only to there devices , not Google even the Google assistant is available for iOS users which is also miles ahead of Siri.. only a matter of time before Google is a serious force against iOS. Also in Android messages built in on pixel 2, I've been able to send and receive money using Google wallet , way before apple made it possible on iOS 11.
i hear what you're saying, but the Pixel 2XL has been a disaster. the original XL had some issues too, including overheating. I can't say which features i want exactly, however i pray we keep that hideous excuse for a control panel the hell away from android.